The 15 Imperial Service Cavalry Brigade carried out the victorious assault on the fortified city of Haifa on September 23, 1918, during World War I. NEW DELHI: “We have landed in India. Thank you to my good friend Narendra Modi for the warm welcome”! 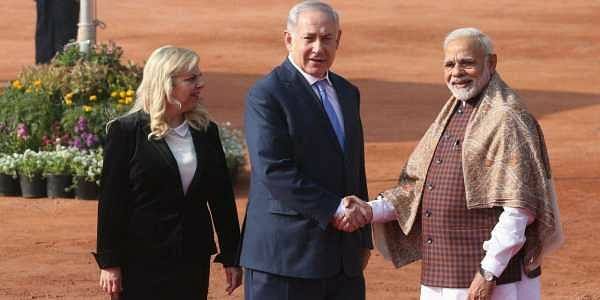 Israeli Prime Minister Benjamin Netanyahu and his Indian counterpart Modi traded greetings on Twitter within minutes of the former’s arrival in New Delhi on Sunday for a state visit. Modi personally received his “good friend” at the airport around 2 pm with the traditional back slapping bear hug, before grasping Netanyahu’s hand and raising it in the air for the cameras. 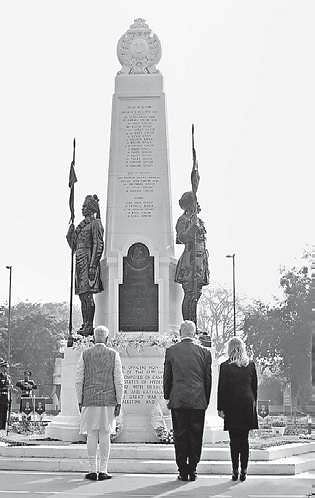 They were then whisked away to the Teen Murti Memorial, to pay homage to soldiers of the 15 Imperial Cavalry Brigade, and to formally rename Teen Murti Chowk as Teen Murti Haifa Chowk. Later, External Affairs Minister Sushma Swaraj called on Netanyahu, followed by a private dinner hosted by Modi. On Monday, after a ceremonial reception at Rashtrapati Bhavan and the traditional wreath-laying ceremony at Rajghat, he will move to Hyderabad House for summit level talks with Modi after which they are expected to hold a joint Press conference. In the evening, he will visit President Ram Nath Kovind, and attend the India-Israel CEOs Forum and India Israel Business Summit. Agreements on water, agriculture, oil and gas, renewable energy, cyber and airport security may be announced. If or not the cancelled deal to acquire the Israeli Rafael Advanced Defence Systems Spike anti-tank guided weapons for the Army will be partially revoked is not known. “I hate being a wet blanket”, said a former diplomat who had served in Israel.